Another view of the fabulous beach. Our building lobby. Each building has a concierge on 24 hours, butler service and lots of staff to cater to your every want and whim. View of the pool area. Buildings in the background were another hotel in the Iberostar complex. View of the pool area and the bulding that houses the restaurants. Neither Susan or I had ever been to Mexico so we decided to rectify this problem by taking a short vacation. 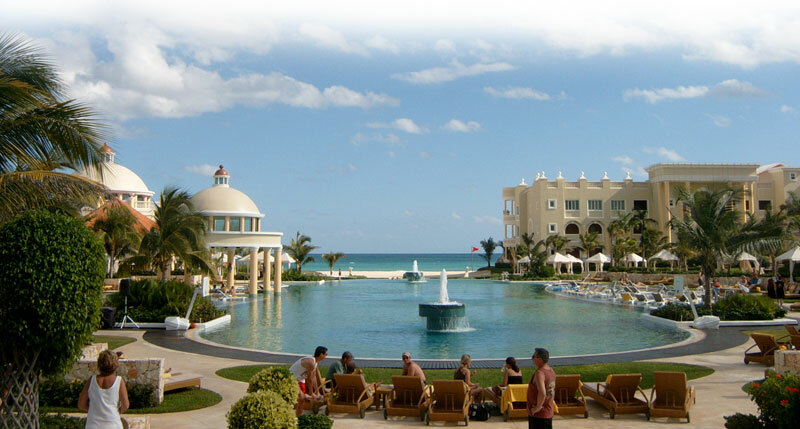 We had been told that the Spanish hotels owned and run by Iberostar were excellent so I went to the Iberostar web site to see what they had on offer in Mexico. 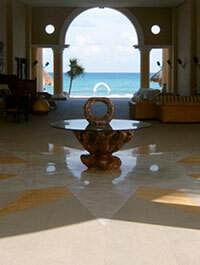 They had one hotel in Cozumel, two in Playa del Carmen and five in Playa Paraíso. "The Iberostar Grand hotel is a five-star all-inclusive resort that sits directly on Playacar's breathtaking beach, just a five minute cab ride from Playa del Carmen in Riviera Maya, Mexico. Today, it's the most happening tourist spot with lots of bars, restaurants, nightclubs, shops and a ton of charm. After a great day at the beach of relaxing and enjoying water sports, Quinta Avenida or Fifth Avenue is next on the list of things to do. For the ultimate beach vacation in the Caribbean, Playa is the place to be. 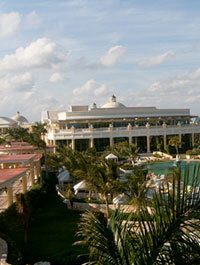 The Iberostar Grand hotel is lavishness at its best. This is where adults come to experience a whole new level of luxury. In this five-star all-inclusive resort richness is all around you, from elaborate staircases and an extraordinary garden with every plant and flower conceivable to exclusive a la carte restaurants, and a cigar bar, concierge, and more. As part of the Grand collection, this masterpiece is in a class all on its own, complete with "Grand Star Service" with butlers in rooms, by the beach and poolside. The Iberostar Grand Hotel even has its very own private spa complete with Thalasso pool, gym and steam room. Not to mention, an infinity pool filled with 'cenotes' water. Because at Iberostar Grand hotel Paraiso, even floating around is an opulent experience." So far so good. Next I checked to see what other travelers had to say on Trip Advisor. 358 reviews rated the hotel 4.5 or 5 out of 5 for rooms, service, value and cleanliness. Recommended for honeymoons and older travelers. So far we were on the money. Adjectives abound in the comments. "Best hotel 2008, exceptional, perfect, amazing, wonderful, heaven on earth." What more could we ask for. Two free rounds of golf on a Pete Dye course. Done! 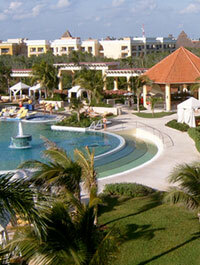 As far as I was concerned it was going to be the Grand Paraíso for our first vacation in Mexico. I showed Susan the pictures online and she agreed. What stunned me was the number of pictures of the food on Trip Advisor. Apparently, the food blew visitors away. The photos showed small portions of designer food constructions with designs drawn with squeeze bottles and things balanced on top of other things. That's all well and good, but I am all about taste. I checked online for availability and it didn't seem to be a problem in early December. We booked a six day trip Dec 1 - 6, through our travel agent at Liberty Travel in Wilmington, Delaware and he saved us over $500 as compared to the online prices quoted for air and hotel. A week later and the place was booked solid. We got lucky. TRAVEL There were a few surprises at the Philadelphia airport. First, they charged me $50 for my golf clubs... second bag, and another $50 for a bag that weighed 60 lbs, 10 lbs over the limit. This was a new thing, in force for two days, so there went $100 of the savings. I was not happy. For the flight back to Philadelphia I packed some stuff into the golf bag and lowered the weight in the other two. I figured that would save us $50, but I was wrong. It saved us $74. 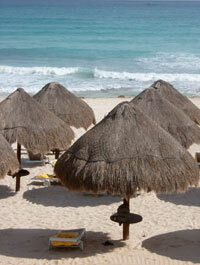 USAir in Cancun charged us just $26 for the third bag. Seems wrong to me to charge two different fees for the same third bag. Should be one charge no matter where you are flying from or to. Frankly, I was really impressed with the airport at Cancun. From clearing immigration to the baggage claim to the transfer to our hotel by Olympus Tours, everything was handled well. Despite that, by the time we got to the hotel we had been traveling for what seemed like 10 hours and we were pretty exhausted. Oh, one other thing. They don't require you to take your shoes off when being cleared for a flight. THE HOTEL The hotel, newly completed in 2007, is part of a really huge complex that includes two or three other Iberostar hotels. The Grand was set on the beach by itself and is the only one that was adults only. It is so big that the staff will run you about on golf cart to wherever you want to go. The operation is well orchestrated. They checked us in at our room. Just took us directly to the room and brought the papers to us to sign. Tagged us with wrist bands that identified us a staying at the Grand and we were off to have a late buffet lunch within minutes. Our room, a junior suite, was on the second floor with a balcony that overlooked the ocean. The room was very comfortable with a well appointed marble and glass bathroom with Jacuzzi tub, shower with rain showerhead, two sinks, robes and slippers (neither was big enough for me to fit into) and plenty of outlets. The balcony overlooking the beach was a great place to relax and read with the sound of the waves in the background. The suite had a well stocked mini-bar and you can have any premium liquor you want except for Jamaican or Puerto Rican rums. Suffice it to say, Susan's first impressions of the place were that it was too big and that it was a mistake for us. She said, "I don't like this place." The next day she was telling me that we didn't book a long enough stay. That was after a morning at the pool and after her second or third Mojito I think. Not sure, I had had a few myself. FOOD There are four restaurants at the hotel. Gourmet, Surf & Turf, Italian and Japanese. We ate at all but the Italian. Couldn't get a reservation before 9PM which is later than we like to dine. I rate the food as good. Of the three restaurants I like the Japanese the least, but I lived in Japan if that means anything. The service was excellent at all of the restaurants, but I will say that the descriptions on the menus were a bit misleading sometimes. Especially when it came to dessert. But I am not complaining at all. Believe me, we did not go hungry for want of finding something on the menu we liked. GOLF The golf course is part of the complex and was carved right out of the jungle. A quirky course with some crazy holes... it was friendly one minute and diabolical the next. The greens were in great shape and so were the fairways. There were, however, quite a few holes that left you wondering where to aim off the tee, the kind of par fours where you couldn't see the pin from the tee and wondered if it was a dog leg left or right. No yardage books were available, so the first round was a learning curve. I will say that the 18th hole is ridiculous. Beyond that the course is playable, but far from one of my favorites. Pace of play is fine, the beverages and snacks are all included under the all-inclusive package (unusual) and the staff couldn't be more friendly and helpful. Oh... stay out of the rough. It is spungy and really difficult to chip out of. Also, playing a run up links-style shot to the greens is tough to judge because the grass grabs the ball and just stops it. Challenging to say the least. Did we enjoy our stay? Yes, yes and yes! Would we return to the Grand Paraíso? Yes, probably for a longer stay though so we would have time to include a side trip or two without feeling like me missed our relaxation time at the pool or beach. Will we return to Mexico? Definitely!